Neck pain can be very frustrating and sometimes exercises can make it worse. Today we are covering exercises that will help alleviate some of that pain. 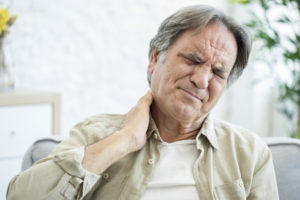 Read more below about the exercises and the proper techniques to help alleviate your pain. In my opinion, and that of many experts, the main reason for neck tension and pain is often a lack of mobility of the thoracic spine. The thoracic spine is designed to move in the form of rotations (turning), flexions (bending) and extensions (straightening). However, the opposite is often the case in daily life. We have turned into marathon sitters and couch potatoes whose poor posture is increasingly limiting the functional mobility of the spine. In the case of acute neck tension, there are a number of methods you can use to relieve the pain. The following five exercises improve the mobility and the flexibility of your thoracic spine. Giving yourself a myofascial massage with the help of tennis balls or fascia (foam) rollers is another good way to release muscle tension. Lie on your back. Place the foam roller under your back at the height of your shoulder blades. Raise your hips off the floor and engage your abs and glutes. Make sure that your hips, back and neck form a straight line. Put your hands behind your head to support your neck. Slowly roll back and forth to massage your back muscles and mobilize your spine. You can use a tennis or a golf ball to target specific painful spots. Maintain pressure on particularly painful spots for 20 to 40 seconds until the pain subsides. Stand with your back to a wall. Your arms and your entire spine should be touching the wall. Pull your shoulder blades back and down. Press against the wall with your shoulders, elbows and wrists. Move your arms through the various positions to form the different letters. Start by bending your elbows and moving them up to chest level to form a W.
Lie on your stomach. Place your arms at your side with your elbows slightly bent. Perform the exercise in the same way as the standing position, but this time in the prone position. Repeat the exercise several times. Sit on a chair. Keep your upper body straight and lace your hands behind your head with your elbows pointing out. Put the foam roller between your thighs. Press your thighs together to stabilize your hips. Turn your head, elbow, shoulder girdle and thoracic spine to the side. While still in this position, tilt your upper body to the side. Repeat the exercise several times. Original article posted by Runtastic.com. PreviousPrevious post:Is it Time to Visit a Back Specialist for Your Low Back Pain?NextNext post:Can a Healthy Diet Prevent Neck Pain?